Zambezi River Cruise offers you the most complete range of cruises on the mighty Zambezi River, in Victoria Falls, Zimbabwe. 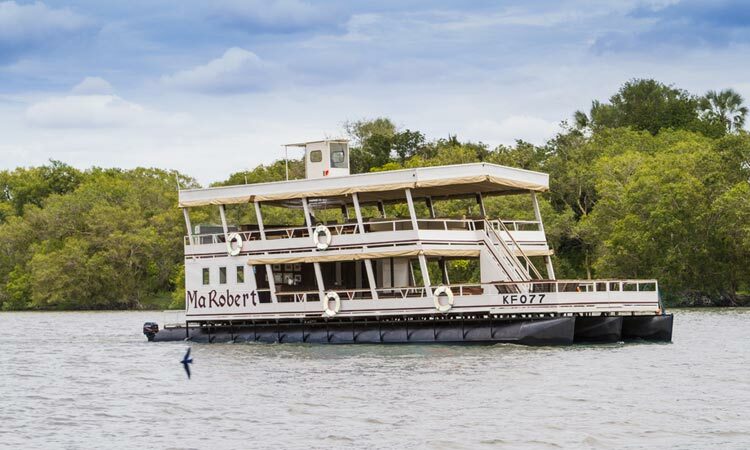 A cruise on the mighty Zambezi River is a fantastic way to relax at the end of a fun filled day in Victoria Falls. Which makes this a must do activity when visiting Victoria Falls. That is why we offer a number of Zambezi River Cruise options for you to choose from, as we wouldn't want you to miss out. 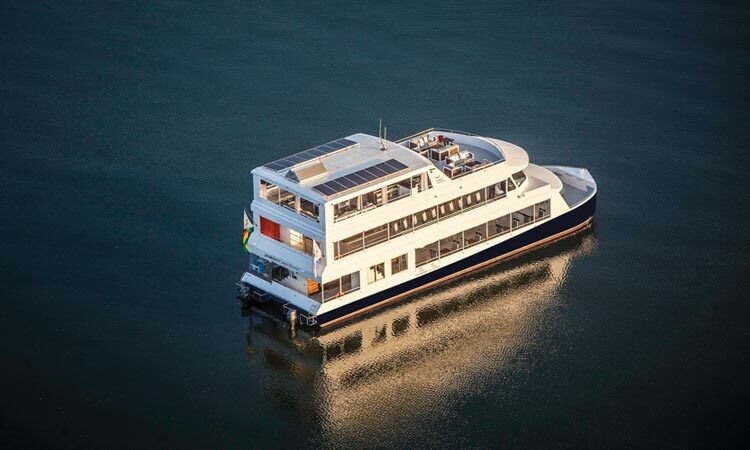 Choose from a number of variations of the most popular Classic, Luxury or Signature Sunset Cruises and sip gin & tonics as the sun sinks into the mighty Zambezi River. Or spoil yourself to a romantic Dinner Cruise and enjoy a four course meal as you float above the Victoria Falls. The cruise options in Victoria Falls are aplenty and cater for a range of budgets and preferences. Browse the below Zambezi River cruise options and select the one that best suits you. 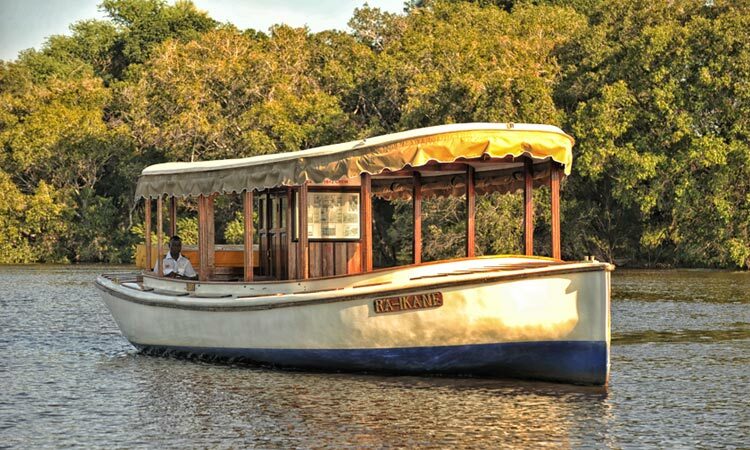 Being one of the most popular activities in Victoria Falls, there are a range of vessels just waiting to welcome you aboard. The Victoria Falls cruise vessels range from, perhaps the most famous and luxurious Zambezi Explorer, to the more rustic or historic vessels that represent the grace of a bygone era and honour the rich history of Victoria Falls. The most luxurious boat on the Zambezi River, aptly named the Zambezi Explorer. There are three decks onboard the Zambezi Explorer. The two lower decks provide a luxury service where guests can choose from an exciting range of beverages and cocktails as well as a selection of delicious snacks. The 'Signature Deck' is the uppermost level and it is pure extravagance with gourmet hors d'oeuvres and premium beverages served from a private bar. Ma Robert is an immaculate, well maintained steel catamaran vessel set on two levels allowing for variance in elevation. A spacious bottom deck gives it a breathtaking river experience with an easy to access rear bar and washrooms. The top level with its central bar, is designed to give every guest an outward view allowing them to freely peer down onto the islands and surrounding riverine as the boat etches on slowly up the mighty Zambezi. Zambezi Reflections is a dedicated floating restaurant offering gourmet meals on the mighty Zambezi River above the Victoria Falls. It is quickly gaining the reputation as the premier dining experience on the river and is perfect for either group bookings or individual travelers. The Dinner Cruise, which combines a Sunset Cruise with dinner, has proved to be a popular option amongst guests due it its great value for money. The Ra-Ikane was fashioned after David Livingstone’s exploration boat. The Ra-Ikane is named after the instrumental guide who accompanied and assisted Livingstone in his monumental discovery of the majestic Victoria Falls. The design of the Ra-Ikane enables it to position passengers closer to the water, further up the Zambezi River, and closer to the banks in the shallow water. The boat represent the grace of a bygone era and honours the rich history of Victoria Falls and its explorers, adventurers and heroes. Moondancer is a double decker dinner cruise boat with the kitchen upstairs and a capacity of up to 56 pax for dinner. Moondancer is a fibre glass boat with pontoon type hulls, which allows you to enter shallower waters and channels allowing you better game viewing opportunities. It also allows you to get close and personal to wildlife on the banks of the Zambezi River. In turn giving you great photographic opportunities. The Shearwater river cruise boats are all fibreglass and pontoon style. The cruise boat is a double decker cruises with a viewing platform upstairs and a capacity of up to 40 pax for sunset. Before booking a Zambezi River Cruise in Victoria Falls, please read some of the below more frequently asked questions about cruising on the Zambezi River in Victoria Falls. What is the min age allowed? Guests of all ages are welcome of a Zambezi River Cruise. Children under 12 pay half price and children 2 and younger are free. Will we see wildlife on the cruise? Although wildlife sightings are not guaranteed on a Zambezi River cruise, with the banks of the Zambezi National Park flanking each cruise, you’ll be likely to spot elephants, hippos, crocodiles, a range of antelope species and a range of exciting birdlife. Do we still cruise if it is raining? Your safety and enjoyment is our main concern. Your Victoria Falls River Cruise may be delayed due to weather conditions. Normally rainstorms only last about half an hour, so be patient, we will try to ensure you get to experience your cruise. If it starts raining while you are on your cruise, rain flaps on the side of the boat will drop down to keep you dry. National Parks fees are not part of the Zambezi River Cruise price. They are an additional fee charged by the Government to help maintain the Zambezi River and the surrounding National Park areas. These fees are to paid on arrival before your cruise and are US$10 per adult and US$5 per child. So which time of year is best to experience a Zambezi River Cruise in Victoria Falls? The real answer is all year round. During the dryer months between June and September you are more likely to spot wildlife on the banks of the river. However a Zambezi River Cruise is a "not to be missed" opportunity no matter what time of year you are visiting Victoria Falls. Zambezi River Cruise offers you the most complete range of cruises on the mighty Zambezi River in Victoria Falls, Zimbabwe. Zambezi River Cruise offers luxury Breakfast, Lunch, Sunset and Dinner cruises in Victoria Falls on the mighty Zambezi River. We strive to provide our guests with the best cruising experience on the Zambezi River through unparalleled service on board luxury vessels. With a fantastic hospitality team, our guests are taken on a luxury adventure in comfort and style. All that’s left to do is sit back, relax and enjoy Zambezi style cuisine, excellent service and the spectacular scenery. Each cruise leaves from the Zambezi River Cruise Terminal and meanders through the islands, enjoying the abundant wildlife along the banks of the Zambezi River. Each cruise will take approximately 2 hours. We offer scheduled cruises every Breakfast, Lunch, Sunset and Dinner. Other cruises are booked in advance. 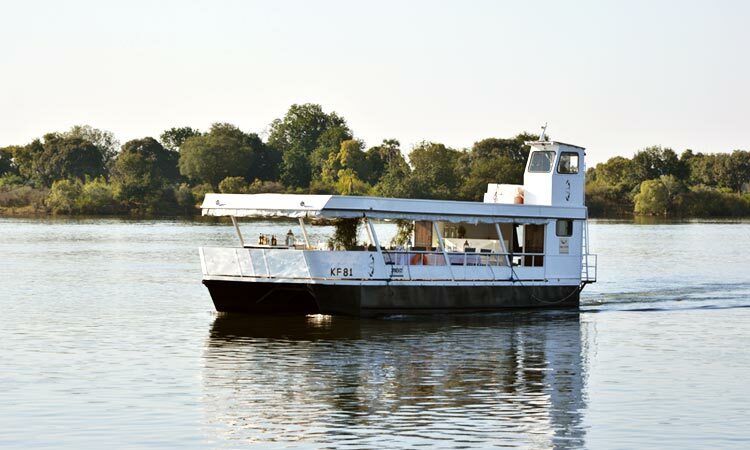 Zambezi River cruises are also available for private hire for corporate or social events. Alternatively, a deck can be reserved for a private function and will be solely for your use. 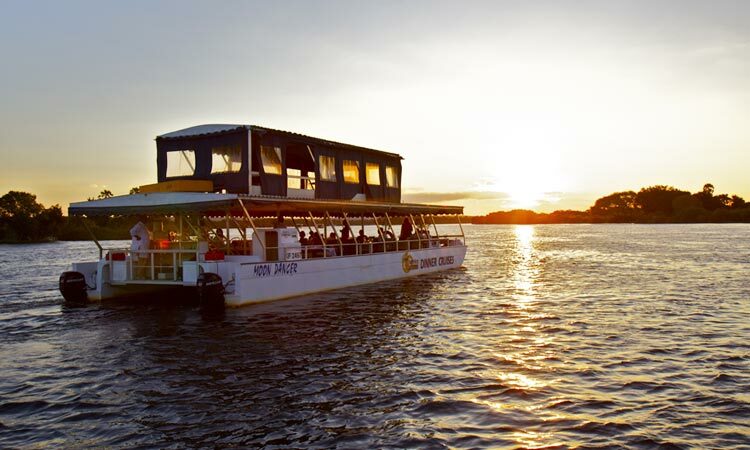 Celebrate the Sunset as we cruise the Zambezi River upstream of the Victoria Falls. The Dinner cruise is a luxury safari on water. The Dinner Cruise, which combines a Sunset Cruise with dinner, has proved to be a popular option amongst guests due it its great value for money. At the end of the day, sail upstream to celebrate the setting African sun. Share in the end-of-day ritual which sees wild herds streaming to the river banks for their last drink. Flocks of birds skim the waterline as the sun sets behind the African skyline. Enjoy our range of cocktails served with an accompaniment of delectable hors d’ oeuvres. Bring a camera and create your own golden memories. Enjoy a gourmet lunch prepared onboard by our executive chef using the finest fresh ingredients. With a bar onboard, guests can choose from a selection of premium beverages. All that's left to do is sit back, relax and enjoy Zambezi style gourmet cuisine, excellent service and the spectacular scenery. Never experienced the serenity of the river at dawn? Have you never watched the mist rise off the water as the new sun rays warm your face? Don't miss the opportunity to soak up the abundant birdlife and capture this precious time of day in all it's glory. Choose from a delectable array of pastries, cereals and fresh fruit as well a freshly made tea and coffee, just the way you like it. Get the most out of your visit to Victoria Falls and combine a relaxing Zambezi River Cruise with other popular Victoria Falls activities. 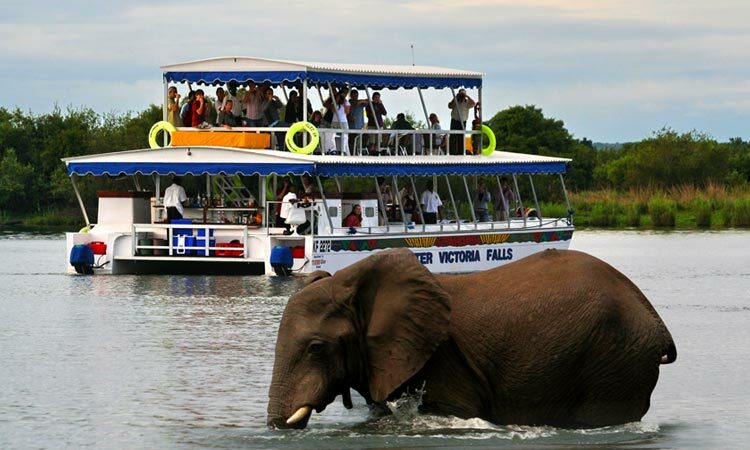 Combine a classic river cruise with some carefully selected activities to compliment your experience in Victoria Falls. We have selected a range of popular Victoria Falls activities such as Helicopter Flights, Victoria Falls Guided Tours and Safari experiences such as Game Drives and Chobe Day Trips so that you get the best experience during your visit. The Zambezi River Cruise terminals in Victoria Falls are conveniently located within a few minutes drive from any hotel in Victoria Falls. This makes for a short 15 minute transfer. Before your cruise you will be picked up from your hotel and transferred to your respective cruise departure point.